The popular progression of video games as rendered in graphic narrative. The subject would seem to be a natural for the comic-book treatment, which can show as well as tell, but the contextual expanse here and the narrative tone result in a work that is less breezy and playful than one might anticipate. Hennessey (The Comic Book Story of Beer: The World's Favorite Beverage from 7000 B.C. to Today's Craft Brewing Revolution, 2015, etc.) and McGowan introduce readers to Japanese history and culture, which, along with World War II (and its emerging technology), the Cold War, the space race, science fiction, and the emergence of the home computer and the internet, they view as essential to their story. The result is a very ambitious history, more than most in this format, which doesn’t even reach Pong until it is almost halfway through and in which Nintendo doesn’t emerge until nearly the end. Hennessey’s previous work includes graphic treatments of The United States Constitution (2008), The Gettysburg Address (2013), and Alexander Hamilton (2017), and his method includes spotlight chapters on major figures in the development of gaming, most unknown outside the video game industry. 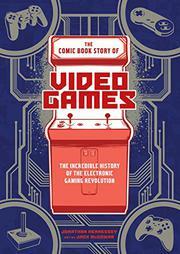 The author and illustrator show how video games developed from their pre-computer incarnations through their popularity in arcades through advancements in special effects and portability. They explain how hackers pushed the technology of gaming forward, how devices developed for war craft found their way into game craft, and how rivalries among and within corporations have turned competitively vicious. The book ends with speculation about how virtual reality technology and corporate data collection might continue to inform not only the world of gaming, but the world at large. Full of interesting information and insight, but nongamers may bog down in the details.